The second choice for BB this month was Ina’s Outrageous Brownies and since many of the devoted Ina lovers in the group have already made these brownies, Eva agreed that add-ins to the recipe would be ok. Good thing because as I’ve made these brownies twice before, I’ve been dying to add other mix-ins to the recipe. Don’t get me wrong. The recipe is perfect as is but sometimes I feel the need to play around a little, especially since I don’t ever add nuts to the recipe. These brownies were slated for a Mother’s day girls weekend at my aunt’s beach house and boy were they the right choice! They were absolutely delicious – perfectly chocolatey and fudgy with the right amount of mix-ins. I recruited my cousin Mariah to help me make them (since she was going to be eating them!) and lo and behold, it was her first time making homemade brownies! We split the recipe into two halves and added chopped Oreos to one batch and peanut butter chips and chopped up Milky Way bars to the other batch (cooking them in 13″x9″ pans for between 50 – 55 minutes each). In all honesty, the pb chip/Milky Way brownies were definitely my favorite (and my mom’s too since she’s as big of a pb fan as I am) but they were definitely messy. I hadn’t thought through the gooey factor of the Milky Way bars upon being baked but when brownies are this good, you can definitely overlook messy. Next time I make them, I think I’ll do just pb chips and maybe swirl some pb on top like the batch I recently made. I did end up freezing quite a few of these since the full recipe makes a TON of human-size brownies and they freeze beautifully. A big thanks goes out to Eva of I’m Boring for choosing such a great recipe and for allowing us to add mix-ins to the recipe!! Go here to see what everyone else added to their brownies. Go here or here for the recipe. Wow! The add-ins really take these over the top. I did a half batch and they were amazing! Yum pretty much sums it up!!! Great ideas on the add-ins. I want some of those PB brownies! You are my hero. 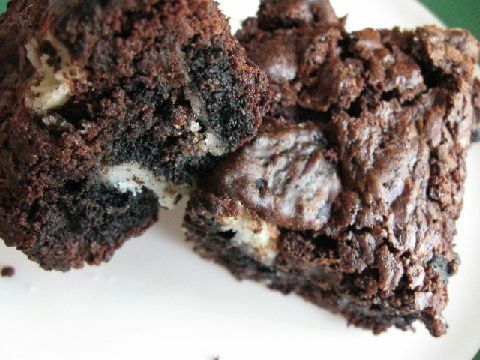 I LOVE Oreos in everything. Great job! 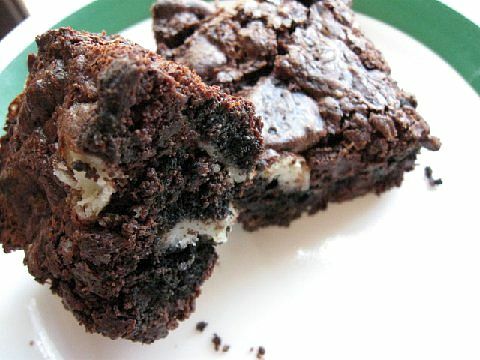 mmmm oreos are so good and i chop up candy bars and throw them into brownies all the time! so good! great job.